Reader Erik asked me to write something about Vanguard’s Target Retirement funds, LifeStrategy funds, and mixing the component funds yourself. These funds are designed for investing for retirement. They invest in a handful of other broadly diversified funds. Vanguard has 12 of them, from Target Retirement Income designed for folks already retired to Target Retirement 2060 for young’uns under 20. The signature trait of these Target Retirement Funds is the glide path. Vanguard explains it very well in this video. Their experts already figured out what the allocation should be at what point in time. You just pick the year you will retire and your asset mix in the fund will automatically rebalance and adjust as years go by. 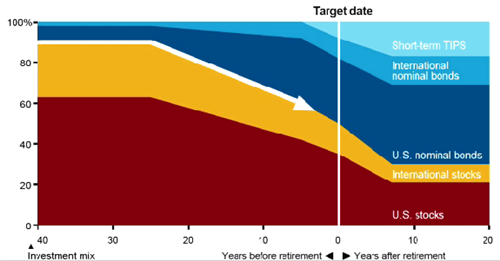 The Target Retirement funds will stay flat at 90% in stocks until 25 years from the target year. Then it will start sliding down gradually to 50% in stocks until the target year, and continue sliding down to 30% in stocks until seven years after the target year. The downside of this one-size-fits-all approach is that it doesn’t take into consideration other factors. Two people planning to retire in the same year can be very different in their risk tolerance, savings rate, the amount they already saved up, etc. Still, if Target Retirement funds are my only options, I would be comfortable using them. Vanguard also has four LifeStrategy funds, ranging from LifeStrategy Income with 20% invested in stocks to LifeStrategy Growth with 80% invested in stocks. They invest in more or less the same component funds as the Target Retirement funds. These are called target-risk funds because they target a risk profile. Unlike in Target Retirement funds, the asset mix in a LifeStrategy fund does not change over time. They don’t have a glide path. The LifeStrategy funds allow you to fine-tune your asset allocation a little bit and design your own glide path, taking into account your risk tolerance, savings rate, the amount you already saved up, etc. You can blend two LifeStrategy funds to achieve any mix between 20% in stocks and 80% in stocks. For example if you want 75% in stocks you just mix 3 parts LifeStrategy Growth (80% in stocks) with 1 part LifeStrategy Moderate Growth (60% in stocks). It’s more work than simply picking a year, but not really that much more work. Again, if LifeStrategy funds are my only options, I would be comfortable using them. Both the Target Retirement funds and the LifeStrategy funds are pretty transparent in their recipe. If you take a look at what they invest in, you can easily copy them and make small tweaks. If you don’t like the newly added international bond fund in the Target Retirement funds and the LifeStrategy funds, you don’t have to include it in your mix. If you want to replace the taxable bond fund with a muni bond fund for your taxable account, you can do that too. You can rebalance less frequently, by 5% bands if you prefer. When you mix your own, you get to invest in the lower-cost Admiral shares of the component funds, saving about 0.1% in expenses every year. One potential problem with a DIY mix is that now you see clearly the performance of the individual components. When stocks do poorly, you see your stock fund doing poorly, even though your bond fund may be doing well. This may make you want to do something about the poorly performing component, whereas it’s all blended together in a Target Retirement fund or LifeStrategy fund. If you can avoid the pitfall, a DIY mix is easily doable. You just take a look at the Target Retirement mix once a year and make your small adjustments from there. I currently do my own mix. It’s like salad dressing. You can buy premixed dressing in a bottle, mix from two bottles from a store, or make the dressing yourself to your own taste and save a little bit of money too. They all work. Thank you for the post. Mostly because I can keep expense ratios down, I’m going to stick with my DIY mix, but I’ll spend more time comparing it to a Target Retirement fund that matches my risk when I’m adjusting my mix. I’ve stuck with an 80/20 allocation up to this point, so I’m debating now if I should bump that to 90/10 similar to a Target fund and slowly drop it down from there as time goes on. I have the years head of me still and I’m very risk tolerant / not jumpy. I can see where last week could have scared the risk averse though. I’m now doing a combination of this. The Target Retirement Funds in my 401(k) are the Trust Plus version with an expense ratio of .07%. It’s hard for me to approximate Total Stock and Total International in my 401(k) because of the rest of the choices, so I’m going with the Target Retirement in my 401(k) then mimicking the Target Retirement in both Roth IRAs in Vanguard Admiral Shares to keep expenses low, while accounting for the Total Stock ETF (VTI) in my HSA. I personally think that both target date funds and the lifestrategy funds are great options PROVIDED you understand that they’re not cure-alls. They’re simply an easy way to get a desired asset allocation but they guarantee nothing. With that said, we use a simple DIY approach just because I’m a bit of a control freak. I think it is the point. It is almost impossible for a investment savvy person to not do anything to manipulate the portfolio and mess with the preset plan. So these lifestyle fund help keep you hand off the control panel. An idea is to put 80% of fund on auto-pilot and the other 20% to your pick. This way you still feel like you are actively control of your investment. I completely agree with this article. I like recommending target date funds since you can put your money in and literally never look at your investment balance again until you retire. I do the DIY method because I like saving on the ER’s(able to invest admiral .1% ER vs target fund of ~.5% ER) but I don’t think there’s much middle ground. The people who only dabble with investments and go the DIY route are probably also the ones who are going to mess around with things once the market takes a dip. I haven’t experienced a bear market yet but I pretty much avoid the day to day shifts of the market so I’m not tempted to tweak things. So far, so good. I don’t like the target date funds since I like to stay the course. Vanguard’s made several changes since these opened. Vanguard and other fund companies don’t seem to stay the course, in a few years or maybe even this year I would expect these funds to be different. – Increased stock allocation ~75 -> 90%? The changes are arguably good and justifiable though. Increase to 90% stocks because the portfolio size in early years is small (I argued for 100% last week). 30% international reduces home country bias (I have been 30% all along). Short-term TIPS because they offer the same inflation protection as longer term TIPS. The case for international bonds is weaker but I can’t see them hurting that much either. Vanguard is making these changes so that the investors don’t have to worry about the fine details. They get to focus on the most important part of the job: save. Confession time: I make more [small] changes to my DIY mix than Vanguard does to theirs. Sometimes I wonder if I’m really better off using their prefixed dressing. Another reason you may want a DIY mix is if you have a blend of your assets in retirement and non-retirement accounts… you can put the less tax-efficient assets (e.g., bond funds) in the retirement account. Some here suggest putting bonds in taxable. I’m not sure it’s such a bad idea. It may be irrational, but behaviorally speaking, I think I’m less likely to panic sell when I know that I am not going to withdraw the $$ for 40 years. There’s also the fact that bonds are yielding next to nothing the past couple years so there’s not much tax hit for someone with “normal” wealth. Obviously those with high net might want to approach it differently. What do you think the chances are that Vanguard will eventually lower the expense ratios of the Target Retirement funds to equal that of the admiral share equivalents? Maybe in employer-sponsored plans but unlikely to retail investors. These funds already offer the lowest expenses among competing products. There is no reason to cut the price in half. I just computed what the Target 2010 allocation would cost in admiral shares and it came up at 0.1% for a DIY effort. Given that Target 2010 charges 0.16% as a management fee, this is basically your admiral cost plus 0.06% for the rebalancing activity. They already do this in employer sponsored plans. IT’s called signal shares which is equivalent to admiral shares. We have these funds in our Nationwide 401(k), unfortuantely Nationwide subjects to us 0.75% net asset fee. Blah. I wonder what Vanguard will do when they convert their signal shares to admiral shares (scheduled to take effect in October 2014). I had heard that, due to SEC regulations, admiral shares of the Target Retirement funds are not allowed. It will be interesting to see what happens in October when this conversion takes place. Correction, not the target date funds, but the regular index funds…. If one is retiring early (retiring 15 or 20 years before traditional retirement age of 65), which Target Retirement Fund year to choose? Still choose the year one turns 65? Or is it better to use Lifestrategy or DIY mix?